Kenmare News | Happy birthday Nora! 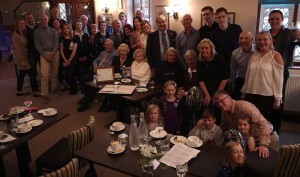 Nora Martin celebrated her 100th birthday with friends and family at Keats Restaurant in Ampfield, Hampshire on Saturday 10th November. Nora was born in Droumbane in 1918 and her father founded Harringtons shoe shop in Henry Street in 1929.